(1979) "Jumping Someone Else's Train"
"Boys Don't Cry (New Voice - New Mix)"
"Pillbox Tales", "Do the Hansa"
(1985) "Boys Don't Cry (New Voice - New Mix)"
(1986) "Why Can't I Be You?" "Boys Don't Cry" is a song by English rock band The Cure. 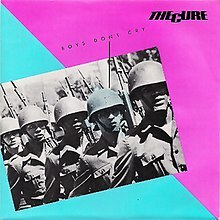 It was released in the UK as a stand-alone single in June 1979, and was included as the title track on Boys Don't Cry, the American equivalent to Three Imaginary Boys. 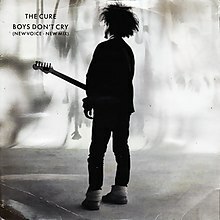 Written by Michael Dempsey, Robert Smith, and Lol Tolhurst, the lyrics tell the story of a man who has given up trying to regain the love that he has lost, and tries to disguise his true emotional state by "laughing, hiding the tears in [his] eyes, 'cause boys don't cry". In April 1986, it was re-released under the title "New Voice · New Mix", in which the original track was remixed and the vocals re-recorded. The new version has not appeared on any subsequent release by the Cure, but can be heard in the music video for "Boys Don't Cry". It was released to promote Standing on a Beach; however, the original version of the song appears on the album. The video, released in 1986 to promote the "New Voice New Mix" re-recording, features three children miming the song. Behind a curtain, Smith, Tolhurst, and Dempsey (in his only appearance with the band since his 1979 departure), appear as the children's shadows, with red eyes. The 1999 film Boys Don't Cry took its title from the song; a cover version, performed by Nathan Larson, was used as the title song for the film. The song has appeared in numerous other films, including The Wedding Singer, 50 First Dates, Starter for Ten, I Do, Nick and Norah's Infinite Playlist, Friends with Benefits (a cover version, performed by Grant-Lee Phillips, is used in the soundtrack of the film) and Me and You. The post-grunge band Oleander covered the song on their 1999 album February Son. In 2018, the song was the subject of an episode of the BBC Radio 4 series Soul Music. The programme featured an interview with Tolhurst about the history of the song. "Boys Don't Cry (New Voice · New Mix)"
^ Anthony DeCurtis; James Henke; Holly George-Warren (1992). The Rolling Stone Album Guide: Completely New Reviews : Every Essential Album, Every Essential Artist. Random House. p. 173. ISBN 978-0-679-73729-2. ^ Dominic Pedler (25 May 2010). The Songwriting Secrets Of The Beatles. Omnibus Press. p. 84. ISBN 978-0-85712-346-6. ^ SPIN Media LLC (June 1992). SPIN. SPIN Media LLC. p. 32. ISSN 0886-3032. ^ "Boys Don't Cry". BBC Radio 4 - Soul Music. 17 January 2018. Retrieved 19 January 2018. ^ Roberts, David (2006). British Hit Singles & Albums (19th ed.). London: Guinness World Records Limited. p. 130. ISBN 1-904994-10-5. ^ "Italian single certifications – The Cure – Boys Don't Cry" (in Italian). Federazione Industria Musicale Italiana. Retrieved 25 February 2019. Select "2019" in the "Anno" drop-down menu. Select "Boys Don't Cry" in the "Filtra" field. Select "Singoli online" under "Sezione". ^ "British single certifications – The Cure – Boys don't cry". British Phonographic Industry. Retrieved 13 July 2018. Select singles in the Format field. Select Silver in the Certification field. Type Boys don't cry in the "Search BPI Awards" field and then press Enter. This page was last edited on 27 March 2019, at 18:50 (UTC).